The student councils (both primary and secondary) have been working on this project for 2 years. They sponsor a 14 year old girl, so she can stay in education for another 2 years. All they ask is for £240 per year for 2 years. This year we have raised at lot more - £805 - which is a fantastic bonus . Below is text extracted from an email by Phil Nevett who runs the Jesuit Nevett Fund for Children, which is the charity Ash Field's donation goes to in order to sponser a student. '...Last Wednesday - 3rd May - I played host to two visitors, one from India and the other from London. The first was Fr Dominic Jayakumar, who is the Jesuit mission supervisor in Tamil Nadu State, Southern India. For over 50 years the Jesuit Nevett Fund for Children has been supporting education projects in Tamil Nadu and Dominic was visiting Europe to express thanks to supporters and donors. Whilst in England he was joined by Thayriam George, a young Indian man who is currently studying at Heythrop College in London. Fifteen years ago, when Thayriam was struggling to complete his studies, he received help from the Nevett Fund and went on to pass his exams. He also wanted the chance to say thank you, as he is "the proof of the pudding"! We had a very full day, starting with a school Assembly at Burbage Infants School. I showed some photos of our work in India and then Dominic and Thayriam taught the children a Tamil song, which they thoroughly enjoyed. We then moved on to Westfield Junior School. There we were treated to a short performance by the school choir under the direction of Mrs Osborne. This was most entertaining. We then met with some staff and the school council to discuss how money raised by the school could be best used in Tamil Nadu. We had lunch with staff and children at Westfield Infants School and Dominic and Thayriam were then given a guided tour of the site. In the afternoon we paid a visit to Ash Field Academy in Leicester. There we met with a group of pupils and staff for a Q and A session. This was very lively and ended with a cheque presentation of money raised at the school's Easter fair. Ash Field had raised the magnificent sum of £805. This will be used to sponsor a 6th form student in Pondicherry and help with a classroom building project at St Mathias High School in Pondicherry. All the schools visited are contributing towards this project and sponsoring girl students. 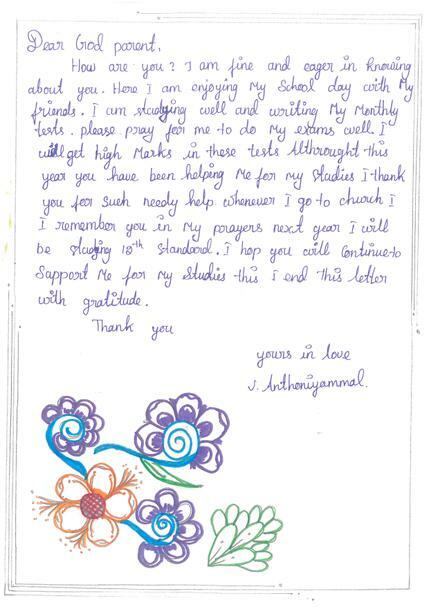 In the accompanying pictures is the latest letter Ash Field has received from our sponsored student.